Be picked up at your hotel lobby and transferred to the airport; catch the 2-hour flight to Guilin. Meet our Guilin local tour guide at the airport arrival hall, and then drive to hotel for checkin. Your Guilin tour starts with one of the symbol of Guilin-the Reed Flute Cave, which presents various unique shapes by the Karst formations of stone columns, stalactites and stalagmites. After lunch, drive to Jiangtou Village which is reputed as one of seven the most valuable ancient villages in China with well-preserved houses built in Ming and Qing Dynasties. Today we will travel to the Longsheng county (2hrs’ drive) and visit its terraced field and minority village. Longji Terraced Flield look like ribbons and stretch layer upon layer from the foot of the mountain to the top. In the Zhuang and Yao Ethnic tribes, you will experience the unique Chinese minority culture. Drive back to Guilin after the tour. 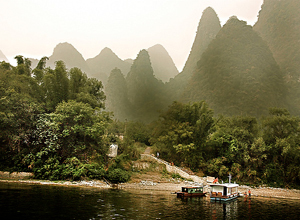 Today enjoy a Li River Cruise down to Yangshuo county, which is the highlight of any travel in Guilin. The beautiful scenery comes all along the way with karst mountains, crystal waters, verdant bamboo forests, narrow bamboo rafts on sail and peaceful local villages. In Yangshuo, you will take a bicycle trip to appreciate the local countryside scenery. A local family’s visit will give you an insight into the farmer’s lifestyle. Free time the rest of day to explore the charming county by yourself. You could have a stoll on the famed West Street full of characteristic souvenir stores, cafe, restaurants and bars. Drive back to Guilin airport to fly back to Shanghai. Shanghai airport to your hotel transfer upon arrival.